You’ll note that I highlighted this “(*)” in yellow. From the footnotes to the report, this “(*)” means this: “Advance estimates are not available for this kind of business.” For purposes of the advance estimate, the Census Bureau “imputes” the data. In other words, the CB fills in a guesstimate. According to the CB propaganda, over 30% of the data used in the monthly estimate is a guess “imputed.” The beauty of this is that the CB has leeway to report a fictitious number for the advance estimate and then revise the original estimate when it reworks its numbers in the annual “benchmark revision” of the data,. By then no one bothers to look or even cares the degree to which the original advance estimated was flawed. The market only cares about the headline number when it’s reported. I would bet a roll of American Silver Eagles that CNBC’s Steve Liesman has no clue about this aspect of the retail sales report. My point here is that the headline report is a fairytale. Furthermore, the headline report is based on nominal numbers. In this case, gasoline sales – for which data for the advance estimate is available – were responsible for one-third of the 0.8% headline increase from October. This increase is largely attributable to gasoline price inflation. In truth, the actual “unit” volume of sales in November vs. October is largely a mystery. Yes, online sales have been strong, but online sales represent less than 10% of total retail sales. Interestingly, the stock market agrees with my analysis of the retail sales situation. The XRT retail ETF was down nearly 2% today (Thursday). The RTH retail ETF was down 0.6%. RTH was down despite the fact that AMZN, which represents 18% of RTH’s assets, was up nearly 0.9%. Government economic reports are notoriously manipulated and thus a highly unreliable indicator of economic activity. The reports have become little more than propaganda tools used to “goal-seek” the political agenda of both the Government and the economic agenda of the Federal Reserve. The graph shows the jump in investor dollars (largely retail investors) tossed at the retail sector (XRT) in November (top panel). The bottom panel shows the short-interest in XRT, which is at its lowest since mid-2015. Short interest dropped 22% over the last month in XRT and is down to 1% of total shares outstanding. 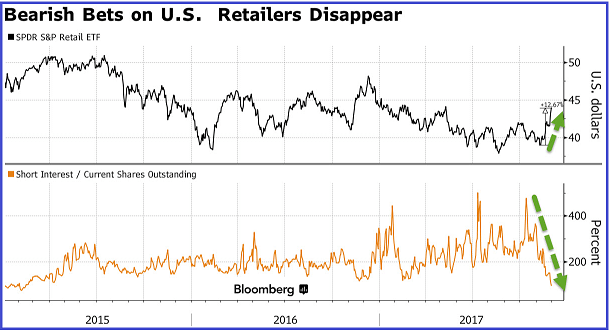 Investors are exceedingly bullish on retail stocks and I believe this exuberance is absent fundamental justification (December 3rd, Short Seller’s Journal). The next issue will of the Short Seller’s Journal will continue to introduce short ideas from the retail stock sector. 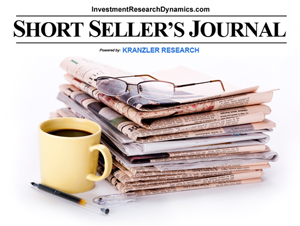 Click here for more information about this unique newsletter: Short Seller’s Journal subscription information. I find it to be mind-blowing when financial advisors and stock market gurus get in bubblevision or write Seeking Alpha articles and assert that the stock market is good “relative” value right now. They are either dishonest, unethical or just stupid. Likely a combination of all three in varying degrees. Based on that graphic, it looks like the current stock market is only the third most overvalued in history, right? WRONG. The problem comparing the current p/e ratio of the S&P 500 with that of previous stock bubble tops is that the accounting used to produce the “e” is not comparable. Over time, FASB and the SEC have colluded to make it easier for companies to hide losses and report non-cash income as GAAP cash flow and earnings..
As an example, in 2010 FASB issued a bulletin which changed the way big Wall Street banks were allowed to account for bonds and other forms of debt issued by others that are held as assets. Originally, banks had to market their bond/debt/loan holdings to market and accrue any market to market gains or losses at quarter-end as either income or expense. FASB decided to let banks classify any and all debt as “hold-to-maturity,” and allowed banks to hold this debt at face (maturity) value without ever marking to market. Any debt that was marked below maturity value (par value) could be marked up to par and moved into a “held to maturity” account. By doing this, the banks created non-cash gains in these holdings that was counted as income. Banks hold $100’s of billions in bonds/loans and, starting in 2011, this rule change allowed banks to create billions in phantom, non-cash income. This of course translates into lower p/e ratios. There’s several areas of accounting over the years that have accomplished a similar feat for all publicly traded companies. The problem is that it has rendered p/e ratios over time incomparable. Of course, NO ONE points out this fact and certainly any Wall Street analyst would be fired if they went on a truth tirade. The bottom line is that, looking at the p/e ratio graph above, we don’t know how the current p/e ratio for the SPX compares with the p/e ratios at the market peaks in 2007 and 2000 and 1929. What we do know is that the current p/e ratio is significantly understated relative to the p/e ratios in 2007 in 2000 because earnings are overstated relative to those years because of the accounting gimmicks that enable companies to boost GAAP non-cash earnings. It could be that the current p/e ratio is the highest on record if we could make an “apples to apple” comparison of p/e ratios across time. In fact, I would assert that applying standardized GAAP across time would prove that the current market is more overvalued than at any time in U.S. history. The above analysis is an excerpt from my latest issue of the Short Seller’s Journal. In this issue I presented two retail stock ideas for shorting. One of them was down 3.7% today and the other was down just under 1%. In the past couple of issues I have explained in detail why the retail sector is short opportunity right now. But that window will close quickly as more companies do what happened to Macy’s and Kohl’s last week. 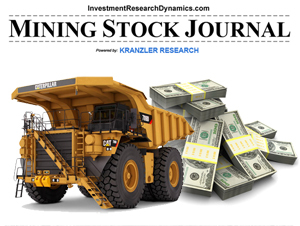 You can get more details on the SSJ and subscribe clicking on this link: Short Seller’s Journal. Turning to the auto sales fake news, based on the SAAR estimates, automobile sales allegedly hit a selling rate of 18.2 million units in December. But seasonal adjustments notwithstanding the facts, does the data fit the facts of the related areas of consumer spending? By this I mean restaurant and retail sales. 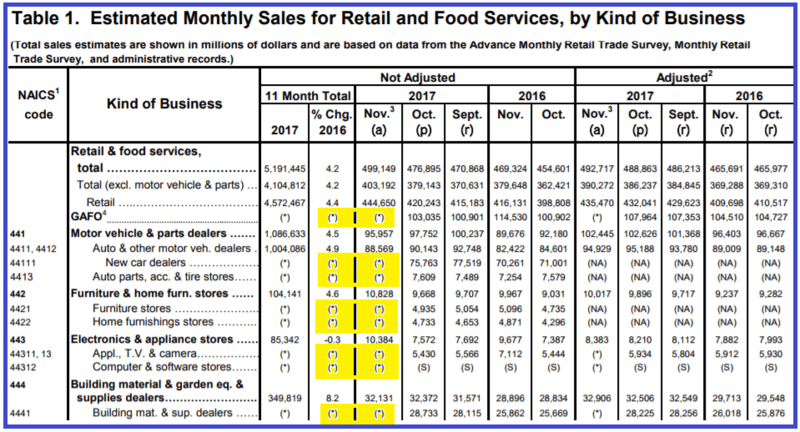 Though not reported yet for December, restaurant same store sales declined 1.3% in November from October and dropped 3.3% from November 2015. It was the ninth consecutive month of negative same-store sales and the worst decline since July. Perhaps with constrained disposable income, consumers cut out restaurants to buy holiday gifts? Looking at what we know about retail sales during the holiday period so far, First Data reported that holiday spending is up 2% vs. last year (through Dec 12). Last year that number was 2.4%. So there’s a deceleration in retails sales growth spending. Cowen research reported that foot traffic at malls was down 10% in December through December 17th. Granted online sales growth of 9% this holiday season is taking some mall spending away, but online spending represents only 8% of total retail sales spending. I guess maybe consumers cut back on holiday gifts this year to spend $40,000 (average cost of a new GM car according the auto sales report) on a new car? Finally, I cover two companies that provide subprime auto loans. Both companies were reporting declining loan application volume in their last financial reports. Interest rates spiked up 100 basis points during November and December, which means the cost of auto loans spiked up as well. Even though auto lenders are reporting lowered loan application volumes, we’re to assume that – despite significantly higher interest rates – consumers decided to skip eating out and buying holiday gifts in order to buy a new car during December? Does any of this make sense? To make matters less believable and uglier, GM reported that its unsold inventory of cars sitting on dealer lots exploded to 844,942 cars in December, a nearly quarter of a million unit increase over December 2015. Call me skeptical but I would suggest that a large portion of those cars sitting in dealer lots were counted as sales when the cars left the factory floor. The likely source of “record” auto sales is in the “seasonal adjustments” that are applied to the data. Moreover, I would suggest that the data itself is suspect. I would like to see a study that correlates a “sale” with the actual transfer of title to either an auto finance company or to a buyer who paid cash – i.e. tie a “sale” to an actual end-user taking delivery and driving off the lot. THAT number, based on all of the related supporting evidence as detailed above, is likely a much different (lower) number than what was reported. The Census Bureau reported that its advance estimates of retail sales for November show a .1% gain from October and a 3.8% gain over November 2015. Wall St. was forecasting a .4% gain. Oops. But there’s a bigger problem with that headline report of a .1% increase in retail sales for November: it’s based on guesstimates by the Census Bureau for the largest retails sales categories. On an inflation-adjusted basis, the .1% “gain” reported for November is a decline. Most are not aware of that fact as well. Also, the .8% gain reported for October was revised down to a .6% gain. It is highly probable that November’s number will be revised to negative when December’s retail sales report hits in January. But the revision for November is typically not reported at all. According to a research piece published by Cowen & Co. on December 14th, mall traffic fell 6.4% in November from October and December month-to-date traffic was down 9.9%. Granted, there’s no question that some portion of that mall traffic has shifted to buying online for its holiday purchases. However, even with the growth in online retail sales, e-commerce accounts for less than 10% of total retail sales (the Census Bureau estimated e-commerce represented 7.7% of total sales in Q3 2016. I have no doubt that the Government’s Census Bureau is going to put forth its best effort to manipulate the sales data it collects in order to present a positive light on December and holiday sales this year. However, the actual reports coming from the retailers themselves reflects a retail environment in which the stores are fiercely competing for a “shrinking pie” of consumer disposable income. Restoration Hardware stock did an 18% cliff-dive two weeks ago when it reported its Q3 earnings. Over the last six trading days, the XRT retail ETF is down 4.2%. It was down every day last week despite the SPX and Dow hitting new all-time highs. In the latest Short Seller’s Journal released Sunday evening, I dive into the retail sales numbers in-depth and present a lot more information which should satisfy proof of concept that this year’s holiday retails sales will be a complete disaster. Note: I have no doubt the Census Bureau and industry promotion organizations will manipulate the data for the holiday season in order to report positive sales results. But the reality check will come from the companies themselves, which have a harder time faking the numbers. I present several retail-related short ideas in the latest SSJ, including options trading suggestions. On of the ideas is already down 1.3% today. You can access these ideas plus in-depth data and analysis using this link: Short Seller’s Journal. SSJ is a monthly subscription. New issues are published weekly and there’s no minimum time commitment. How do we know that retail sales in November were likely much worse than the report spoon-fed to the media/public by the Government? Because retailers cut back their hiring in November vs. November 2014 by at least 5%: November Retail Hiring Falls. If retailers were experiencing steady to increasing sales in November, retail seasonal hiring would have at least been flat. Aside from the mystery surrounding the “seasonal adjustment” calculations, the .2% gain was engineered by revising October’s number down to $447.1 billion from the $447.3 billion originally reported. The subtle maneuver enabled the Government to report a .2% gain instead of a .1% gain. After all, it would be a catastrophe for “Black Friday” Month to show no gain from or a decline from October, which is likely what occurred. The junk-loan financed auto boom is petering out, Obamacare premiums are hitting the mailboxes, the cost of everything needed to get by everyday (except gasoline) is rising. Consumers have little to no disposable income for holiday gift spending. I suspect most households will be cutting way back on all gift-giving other than “mandatory” gifts – kids, immediate family members, etc. This holiday season will be a disaster in terms of retail spending. My new subscription research service, SHORT SELLER’S JOURNAL, will be focusing on retail stock short ideas over the next 4-6 weeks. I’m prepping for next week’s issue, which will be sent out either Sunday evening or Monday morning. 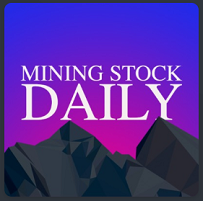 I will likely be including a brief mining stock buy/trade recommendation in addition to stock I’ve selected to feature. If you subscribe before Sunday evening, you’ll be able to access the current issue plus next week’s issue. 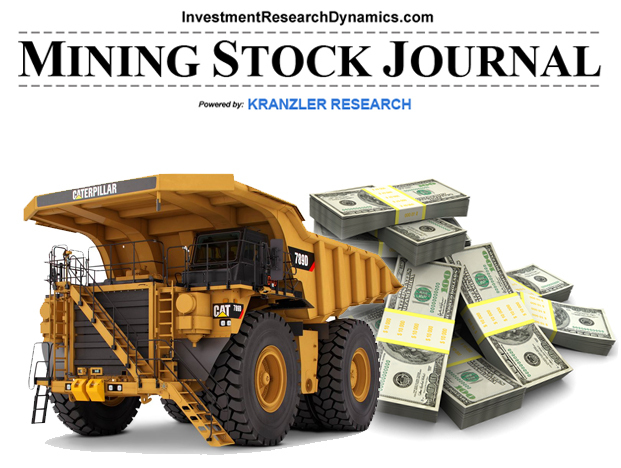 Subscriber’s will get a discount on the big Kinder Morgan research I’m working on. Every day I unearth new, highly negative information on KMI. The Goldman Sachs ICSC chain store sales plunged 6.3% for the week ending December 5 (measured through Saturday each week). The index measures same-store sales for retail chains. A small decline is expected, as this is the week that follows Black Friday week. But I pulled up the data from last year and the same metric declined only 1.8%. And, in 2013 chain store comp sales actually rose 1.5% for the week following Black Friday week. The economy is collapsing. This is evident from the ongoing crash in commodities, especially the price of oil and natural gas. The consumer is tapped out. There’s a law of economics called the Law of Diminishing Returns. It says that if one input in the production of a commodity is increased while all other inputs are held fixed, a point will eventually be reached at which additions of the input yield progressively smaller, or diminishing, increases in output. Traditionally this law would apply to production and manufacturing. But in an economy based on the digital printing press, this law applies to money printing and credit creation. At a certain point, the ability of money printing and credit creation reaches a limit at which it can no longer stimulate consumption. Consumption of homes, cars and discretionary purchases. Retail sales this holiday season will reflect this law as it applies to retail spending. We’ve already seen credit card data from Bank of America that indicates a 10% drop in spending for the November holiday season for through the first three weeks. Goldman’s chain store sales indicator reinforces this stunning fall-off in holiday spending. Do not get fooled into thinking that online sales will make up for the big decline in brick and mortar store sales. Online sales represent just 6% of total retail sales. Even if online sales tick up to 7 or 8% of total sales, the increase of a few $100 million million will barely dent the decline in total sales, which will be in the billions. One more point, November retail sales are due out this Friday at 8:30 a.m. EST. The data is compiled and constructed by the Census Bureau. There is no doubt in my mind that they will do their best to manipulate the data into showing an unexpected gain. Consider the source when you see the report. Next up we will see the application of the Law of Diminishing Returns as it applies to auto and home sales. The Government is already trying to defer the onset of this law in housing as it is now rolling negative down payment, low interest rate mortgages for people with low credit scores. The “negative down payment” is derived from the fact that the homebuyer can borrow money from others to fund the 3% down payment OR take a loan from the community. Sheer insanity.